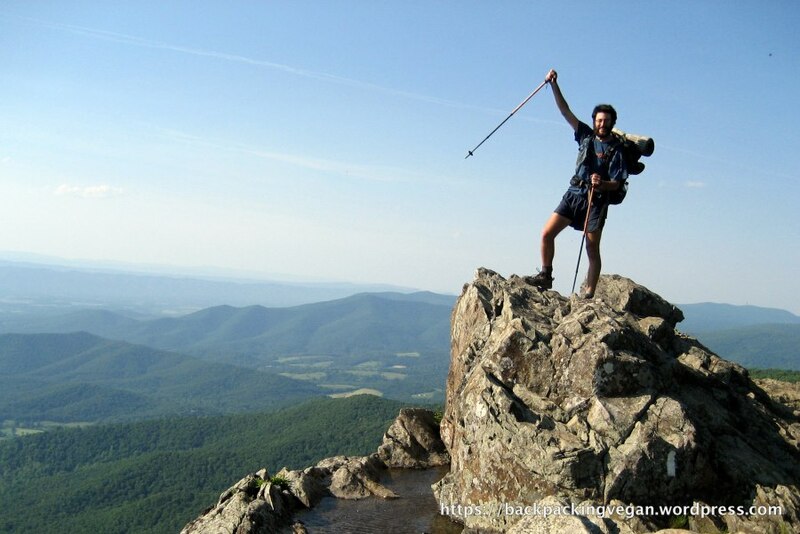 In 2009, Sam Maron hiked every day for about six months. That, in itself, is pretty cool. Add to it that he actually hiked from George to Maine, approximately 2,200 miles on the Appalachian Trail, and that “pretty cool” gets taken up a few notches to “totally awesome”! I’ve recently connected with Sam, via his blog Backpacking Vegan, and asked him a few questions about his epic hike. Hope you enjoy, and be sure to check out his site. There’s loads of helpful info on long-distance hiking, vegan-style! What made you want to hike the Appalachian Trail? Sam: I had dreamt about thru-hiking since I was 13 years old. The summer after seventh grade, I went to an outdoor adventure summer camp that included a four day backpacking trip on the AT in Maine. I was the slowest kid in the group, but I loved every second of it. I loved being out in the woods and carrying everything I needed on my back. We met some long-distance hikers on that trip and I decided that one day I would hike the whole thing. When the opportunity came in 2009, I jumped on it. What gear was essential to such a long distance hike? Sam: There is a lot of essential gear, but it really comes down to a few key things: clothes for hiking, clothes for warmth, food prep, shelter, and a sleeping bag. I was constantly adjusting my gear, trading things out and adding in better options. In the beginning of my hike in March, I carried a 10 degree bag. But after about two months it started to warm up and I switched for a much lighter-weight bag for warm weather. Both sleeping bags are synthetic, I won’t use down! I wore trail runners the whole way, which I would recommend to anyone. It is so much easier to hike in lightweight shoes than heavy hiking boots. There really is no reason to wear boots unless you’re in Alaska bushwacking… Also, trail runners are so easy to find without leather. For my stove I carried a “pepsi can” alcohol stove that I made myself. It weighs less than an ounce and burns denatured alcohol. All I could do was boil water, but it worked for me! No fumbling with fuel canisters, broken parts, or a heavy stove. makes hiking in the rain so much more comfortable! I recommend it to anyone. I would imagine space in your pack was limited. What kinds of things did you bring on the AT? Sam: Every few weeks we would mail things home from our packs. I looked for anything I could get rid of that I wasn’t using regularly… The issue is more about weight than space. Carrying a heavy pack all day long in the mountains is hard! I tried to carry as little as possible, always looking for things with multiple uses. Also, the AT goes near town every couple days, so you’re never that far from civilization. Everyone carries a few luxuries. Even though I was trying to cut down weight all the time, I still carried a book. What did your typical meals look like while hiking the AT? And how did your food differ from others hiking the AT on an omnivorous diet? Sam: My meals looked very similar to most other hikers. For breakfast I generally ate oatmeal when it was cold and then switched to raisin bran. 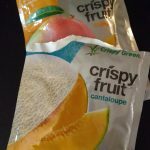 I ate it with water and sometimes a little sugar, it really wasn’t that bad! For lunch I ate bagels and peanut butter. I snacked all day on Clif bars, Pro bars, Oreos, Ginger Snaps, and homemade gorp I made every two weeks at the grocery store out of chocolate chips, raisins, and peanuts. Dinners were the most challenging part of a vegan hike. Some typical backpacker food that has vegan options are Knorr Sides, Vigo or Zatarain’s Rice and Beans, and Tasty Bite Indian dishes. I had to be pretty creative to keep it interesting and eat more than those few things all the time. When I found them, I would get Fantastic brand dehydrated black beans and refried beans and mix them with couscous or instant rice. I also ate other “wet” stuff like Kashi 7 grain mixes. I would try to rotate all of these when I could, and I had two tortillas with every dinner, too. You have to remember that I was easily eating 4000 calories a day! (and I still lost weight during my hike). How do you think being vegan affected your experience on the AT? Sam: Once I figured out how to eat on trail, it wasn’t all that difficult. Everyone gets tired of their food, even omnivores. At some point you’re just sick of dehydrated meals. Psychologically, the most challenging part was when I was in town. Frequently the only restaurant was a diner, which meant all my friends would be wolfing down pancakes, eggs, and other stuff, and I would have french fries. Don’t get me wrong, I love french fries, but when I was in town relaxing I wanted something more fulfilling and substantial. I did always get treats from the grocery store, though. Sam: The most difficult part of the AT was the rain. 2009 was a rainy year, which meant days and days of slogging through the mud and fog, climbing up mountains and not having a view at the top. It was really tough to stay positive when you’re wet allll the time. My favorite experience was hiking with my friends. I found a group of folks early on and we stuck together the whole way. Thru-hiking is a pretty incredible lifestyle. As hard as it is, all you do every day is wake up and hike! Really, how can you complain? I walked 2000 miles from Georgia to Maine, it’s mind blowing. Have you completed any other long distance hikes? Sam: Nothing as long as the AT. I’ve done the Long Trail in Vermont more than once, it’s only 270 miles, which seems like nothing compared to the AT. I’m dreaming about hiking the Pacific Crest Trail. Several people I know from 2009 have hiked it or are hiking this year! What other outdoor activities do you take part in? Sam: I’m a runner and cyclist. 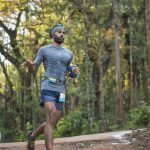 When I finished the AT I thought I would be a strong runner because my legs would be so strong, but the muscles are totally different. I’ve been running more and more over the last two years and really enjoying it. I did my first half marathon last year, and I’m hoping to do another this year, and maybe shoot for a marathon in not too long. I love riding my bike, but mostly for commuting and fun these days. I rode across the country with my dad when I was teenager, and I’ve been dreaming of doing that again as an adult. One day! 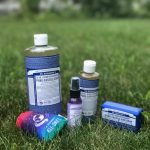 Sam: When I started learning about the environmental impacts of the meat and dairy industry, I knew that they were something that I couldn’t contribute to. According to the United Nations, the meat and dairy industry is the number one contributor to climate change, period. In the West, where we have a choice, I think that we need to drastically shift our eating habits. The sustainability and social justice implications are enormous. I don’t have any false beliefs that my personally being vegan is changing the world, but it helps me feel good to live a responsible life. I’ve been vegan for nine years. 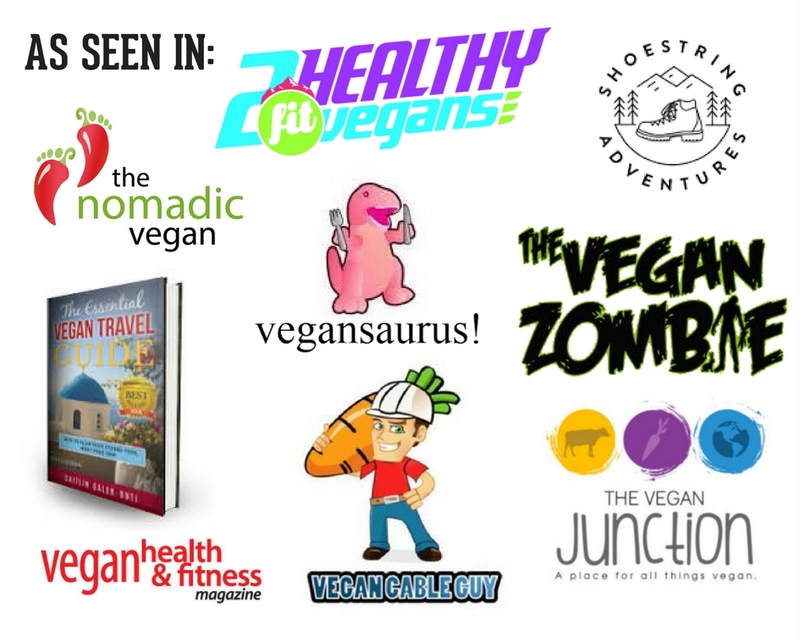 Why did you start Backpacking Vegan? 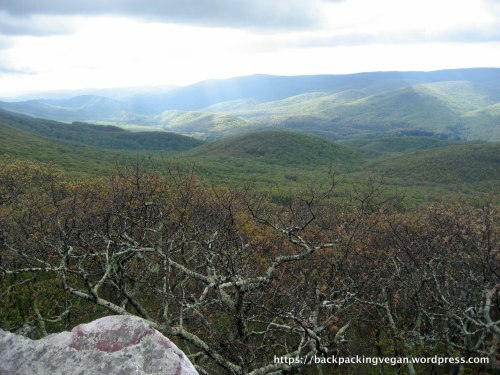 Sam: When I was planning for my thru-hike, I scoured the web looking for advice about hiking vegan. What I found wasn’t promising at all. I couldn’t find anything by past successful vegan thru-hikers, and the AT message boards weren’t very supportive. 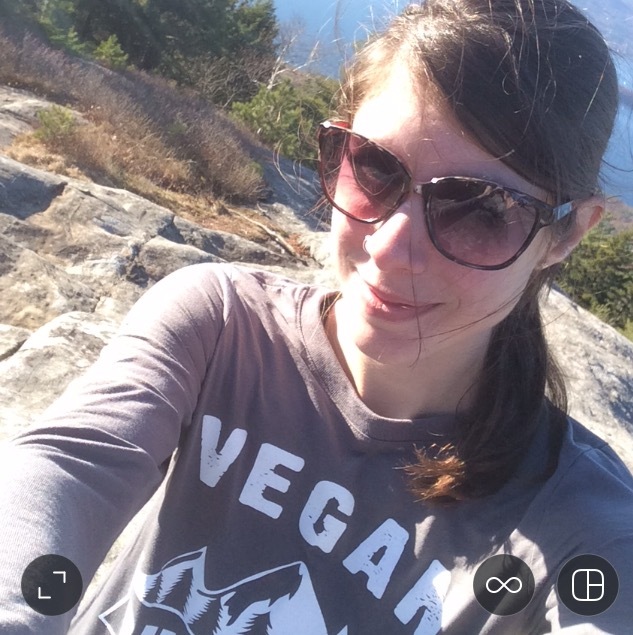 I started the blog to be a resource and inspiration for other vegan hikers, to show that it can be done and you can be just as happy, healthy, and fulfilled as anyone else! What’s the next adventure you’d like to plan? Sam: Well, in real life my next adventure is the PhD program in sociology that I’ll be starting this fall! In the outdoors, I really hope to find the time to do another long hike, even just a month would be so much fun. Thanks, Sam! I know anyone thinking about thru-hikes as a vegan will find this really interesting and helpful. Be sure to check out Sam’s blog Backpacking Vegan and follow him on Twitter.